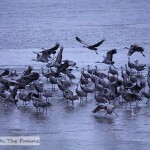 Here’s the video I promised you from yesterday’s post about the Sandhill Crane migration. Be sure to have your speakers turned up. One of the best parts of watching the cranes is listening to their raucus calls. …and off they go…out into the fields to spend another day feeding on waste corn, resting, and preening. In the weeks that they stop over in the Platte River valley, they build up their fat reserves gaining up to 2 pounds of their 10 pound body weight. 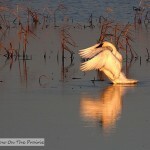 This will sustain them for the rest of their migration north into Canada, Alaska and Siberia. 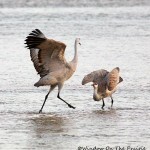 For more information about Sandhill Cranes and their migration, you may visit the Rowe Sanctuary website. I wondered that too. Do they appreciate their daily close up view? 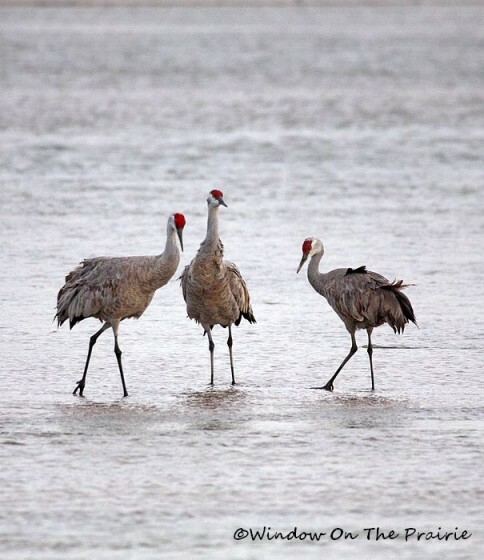 Do they get tired of all the crane calls? I taught at a school that included a lot of crane territory in its farm field locations, as well as a stretch of the Platte River. 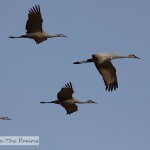 My students complained a lot about the endless noise the cranes made for the 6-8 weeks they were there. They also complained about all of the crane watchers, some of whom were very rude–coming to a full stop in the middle of roads when they spot a flock, driving on private property, etc. 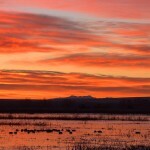 There are many great designated areas to watch the cranes, like Rowe Sanctuary where Susanne went, and Crane Meadows. I tried to tell the kids that people come from all over the world to see the wonder of the cranes, but you know kids…they were just tired of the noise and human encroachment on their peaceful countryside! We noticed a lot of “No Trespassing” signs when we drove around. Shame people can’t behave themselves when visiting. I just now read yesterdays post and watched the video. I have to say I really envy you the trip. That had to be so wonderful to see and your photos and video are great. Thank you so much as I will never get to see that personally. Once in a while we get to see them flying over here in Michigan. I never realized they had that big a wing span. Neat to see – Thanks again. You’re so very welcome Doe. One of the reasons I started this blog was to share our travel experiences with everyone. There’s so much to see out there, endless possiblilites. Thanks Doe. Thanks for the pictures and video of the cranes. I’ve always wanted to see them up close….and now I have. Thanks again. You’re welcome Nell. Thanks for stopping by. Great video, Suzanne. I think I’ll work on my “dance” moves when I get up tomorrow — it seems to work for them, LOL. Have a great day.